Mahiro, an ordinary high school boy, is saved by the Crawling Chaos Nyarlathotep, a monstrous creature straight out of the Lovecraft mythos. 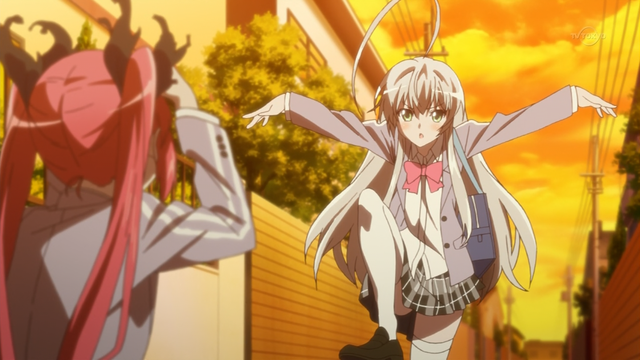 Despite its fearsome name, the Crawling Chaos goes by “Nyaruko” and appears as a cute girl who becomes fanatically devoted to Mahiro. Don’t be scared off like I was if you don’t know anything about Lovecraft— it doesn’t matter. All you need to know is that Lovecraft’s monsters did not want to conquer the world to import Earth’s entertainment and you’ll be fine. At its heart, this is a straight up comedy and harem. Nyaruko has an absurdist style of humor, similar to Milky Holmes (but a bit more grounded). The show continues to bombard you with harebrained twists and turns, such as villains who want to play adult games and who are fighting in the space video game console wars. Nyaruko is in essence a harem, but it doesn’t play it straight. A typical harem lead scarcely notices that a horde of girls has fallen in love with him: Mahiro actively scorns their advances. Nyaruko is the pervert in this harem. Then there’s Kyuuko, who wants to marry Mahiro so she can be indirectly married to Nyaruko, and Hastua, who is the cutest boy ever. What steals the show, though, is Nyaruko herself. Her voicing is superb (I love the accent!) and her stubborn, unashamed advances on Mahiro are hilarious. Based on the description, I would never have imagined this show would be any good. And yet here we are. I hope that creators will learn from this and consider choosing a more creative and quirky premise when producing the next fanservice-laden harem. Storytelling – A – Excellent absurd and quirky sense of humor. Voice – B – Certainly unique. 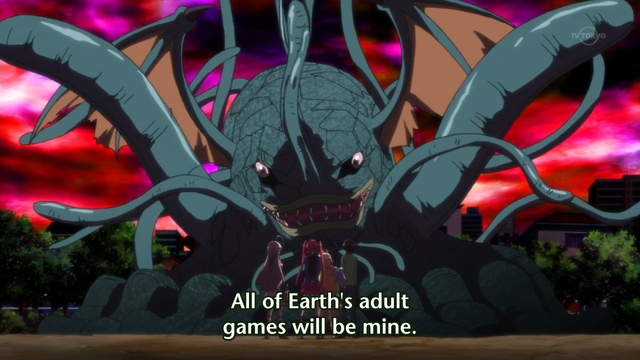 Who else has made a harem about Lovecraftian monsters? Characters – A – I love Nyaruko. Attention Grab – B – Has a few dull moments, such as the last episode, but on the whole kept my attention. Production – B – Excellent voice acting for Nyaruko. This show was so much better than I thought it was going to be. I really want to cosplay Nyaruko. She’s great. Who was your least favorite haremette? The one I liked least was Hasuta. He’s amusing at times, but nowhere near the level of Nyaruko and Kuuko. Traps just can’t compete with raging lesbians and the force of nature that is Nyaruko. I’m still at ep. 8 due to lack of time, but from what I’ve seen I’d say it was decent but not better than Fate/ Zero (which received a “B” from you). Agreed, the absurdist humor was great but I found the characters themselves rather generic and the jokes were getting old after a while. Based on the short anime from last year I expected better. Two things save this show for me, though: I loved Kuuko, a lesbian pettanko is just to my taste. Also, I found the stupid OP pretty addictive, not as good as Platinum Disco but still I had it on constant rotation until my brain died. Eh? I think you were the one who convinced me to keep watching this show after the first episode! Kuuko is awesome, as were Nyaruko and the OP / ED (I think I liked the ED better). The trap was generic and got old, but I didn’t get tired of Kuuko and Nyaruko at all. I know, I know, I recommended this. But the short flash anime was much more throwaway than this “proper” anime show and maybe that’s why I liked it more. Anyways, I think I’m going to finish it one day.